Finally, INTC back to $23 level in pre-market today. When was INTC at $23 and above? I forgot already as it was a very long time ago (Just checked. More than one and a half year). Can it hold at above $23 after market close today? Well, it should be. It better be because INTC was falling behind compare to other technology stock that performing very well like Apple. 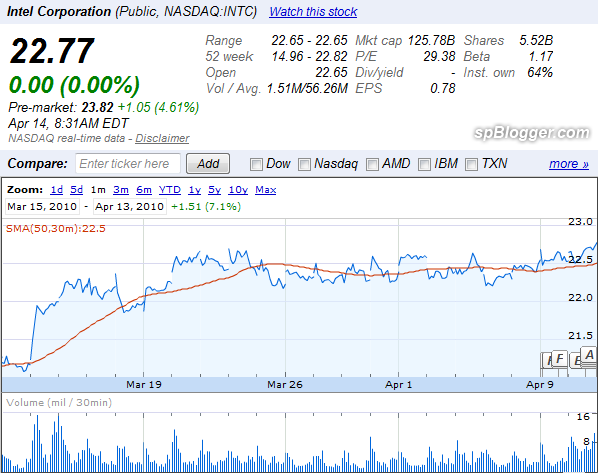 Hopefully, I can sell my stock option by end of this year when INTC hit above $28. Can it? Is INTC worth to keep? Do you trust stock research firm analysis?